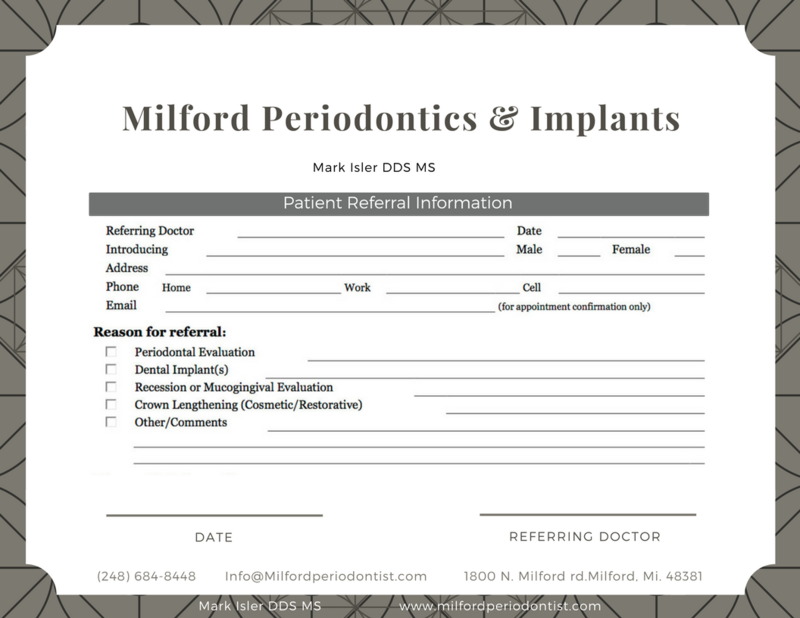 Milford Periodontics & Implants offers a full scope of specialty services. Conveniently located in Milford, Michigan. Dr. Mark Isler practices a full scope of periodontal care with expertise ranging from cosmetic periodontal surgery to dental implants . Dr Isler can help you address a wide variety of periodontal concerns. Everyone's situation is unique, and so is the solution. Schedule your consultation today. Meet with Dr. Isler and he we will create a treatment plan customized specifically for your needs. 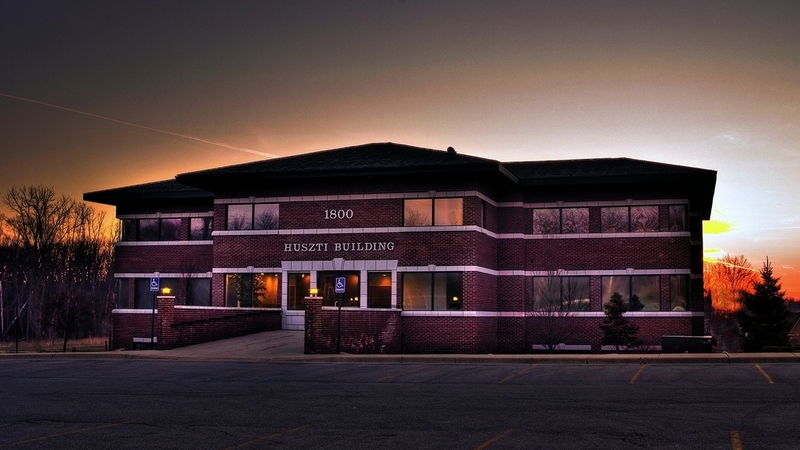 Dr. Mark Isler graduated from the University of Detroit Dental School in 2005. Participating in the accelerated six year “Inteflex program” he received, both, aBachelor's of Science and Doctor of Dental Surgery degree. After practicing in Dearborn, Michigan he returned to the University of Detroit School of Dentistry where he entered their Graduate Periodontal Residency program. Upon completion he achieved his Master's of Science degree in Periodontics and became board certified for the state of Michigan. Mark has been published in the “Practical Procedures in Aesthetic Dentistry” peer-reviewed journal for his clinical work. In addition he has completed training and certification in advanced anesthesia and conscious sedation. Dr. Isler makes educating his patients a top priority. By sharing his knowledge and expertise his patients are better able to choose the treatment that’s best for them. Dr. Isler’s patients enjoy his gentle touchand treatment in a comfortable and relaxed environment. For your convenience we offer online registration. Simply fill out these important forms. Leave the rest to us. We’ll get to work preparing for your first visit! Periodontics is one of the nine dental specialties recognized by the American Dental Association. It focuses on treatment of the soft tissue and bone that support the teeth and jaw. Periodontal disease, also known as gum disease, often begins as a buildup of plaque on the surface of teeth near the gum line. If not removed by regular brushing and flossing, the plaque can harden into tartar. Eventually the gums will become red, swollen, and irritated. This is known as gingivitis. If left untreated, gingivitis can worsen into periodontal disease. If that is not treated, it can contribute to heart disease, diabetes, and other health problems. Periodontal disease during pregnancy has been linked to premature birth or low birth weight. You may be at risk of periodontal disease if you smoke or use tobacco products, do not regularly brush your teeth and floss, have health conditions such as diabetes, heart disease, or osteoporosis, or have family members that have had gum disease. In some cases, it can be genetic. If you observe any of the symptoms of gum disease, schedule an appointment with our office, and we’ll determine if treatment is necessary. this procedure can cover exposed roots to protect them from decay or prepare your teeth for orthodontic treatment. Your tooth sensitivity may be reduced as well, and your smile may also improve! Crown lengthening is a procedure to remove excess gum tissue, exposing more of the “crown” of the tooth. This procedure is for patients who feel their teeth are too short or their gum line is uneven. The gum line is then sculpted to create the right proportion between gum tissue and tooth surface. This can be done to just one tooth, or to enhance your entire smile. Sometimes you may need a few of these procedures to build the framework for your perfect smile. Often, periodontal plastic surgery is used to lay the foundation for further cosmetic enhancements, such as orthodontics and veneers. A combination of periodontal procedures can result in a beautiful new smile and improved periodontal health- your keys to smiling, eating, and speaking with comfort and confidence. Please open, print & fill out the referral form. Send us a copy in the manner most convenient for you. It's A pleasure to assist in the care of your patient.